Navy and Marine service emblems. General James E. Livingston (Captain at the time of MOH decoration) Company E, 2nd Battalion, 4th Marines, 9th Marine Amphibious Brigade, US Marine Corps. General Barry R. McCaffrey (1st Lt at the time of DSC decoration) 2nd Airborne Task Force, Airborne Division Advisory Detachment, US Army. The War is Over! Liberty Studios’ first published title is personally signed by at least 25 WWII vets from all branches of Service, who received America’s top military decorations: The Congressional Medal of Honor, Distinguished Service or Navy Cross. The War is Over!! As headlines from sea to shining sea proclaimed this wonderful news, the hearts of Americans everywhere rejoiced. As the famed lyric said, God had indeed “Shed His Grace” on this nation. Tyranny had been overthrown, but not without great sacrifice and great cost. 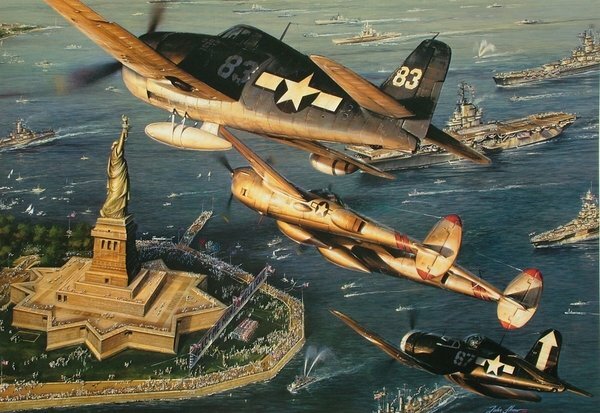 As many war-weary troops returned home into New York harbor, the Statue of Liberty herself seemed to join in with the crowds at her base welcoming them home, proclaiming “welcome home—well done!” Overhead, aircraft proudly representing the WWII branches of service roar overhead in salute…An F6F Hellcat for the Navy, P-38 Lightning for the Army Air Forces, and F4U Corsair for the Marine Corps. Victory at Sea, the painting was created as a partial benefit for the Legion of Valor, an organization comprised of veterans who were recipients of the highest U.S. military decorations, the Congressional Medal of Honor, Distinguished Service Cross and Navy Cross. In the spring of 1994, a lithograph edition was signed at the Legion of Valor Museum in Fresno, California, by an impressive group of these veterans, representing a wide variety of experiences and all branches of service in World War II.